If you consider yourself to be a true artisan then there’s nothing worse that pouring your heart and soul into creating something truly breathtaking only to then be accused of flagrant plagiarism; such an allegation robs you of the unique satisfaction that crafting something truly beautiful brings. 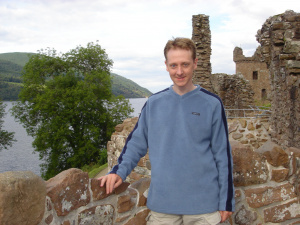 Spare a thought then for the development team of Unirally - they succeeded in forging an astoundingly enjoyable piece of software that was robbed of the limelight thanks to largely unfounded claims of idea-theft. 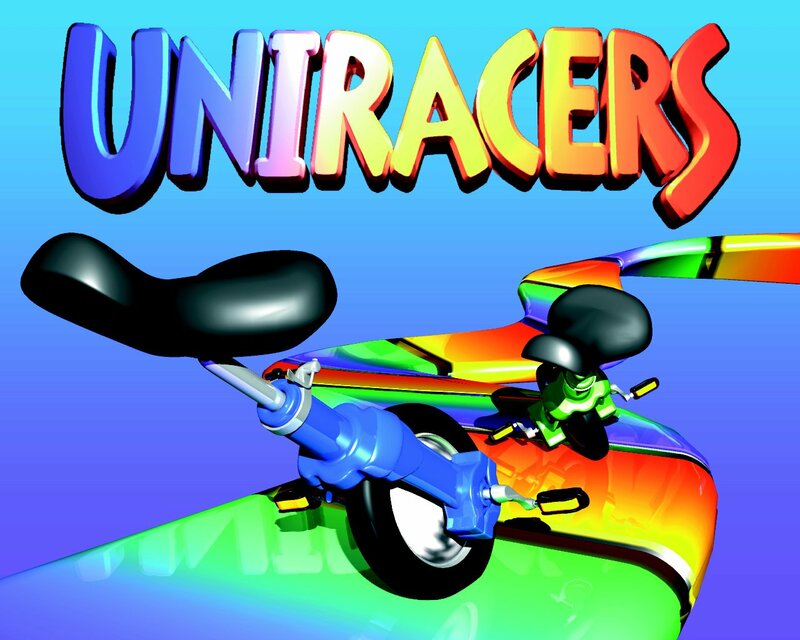 Developed by Scottish code house DMA Design and published for Nintendo’s dominant Super NES console in 1994, Unirally (or Uniracers as it was known outside of Europe) was anything but a conventional video game release. Announced in the CGI-tinged wake of Donkey Kong Country, DMA’s racer was initially viewed with almost equal amounts of suspicion and expectation – the visuals possessed that shiny rendered look that so many developers craved at the time but also retained a degree of simplicity that lead many early sceptics to comment that it was little more than glorified tech demo. Ironically, this was actually closer to the truth than many suspected. 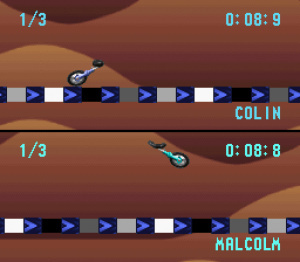 The negative perceptions expressed by some when the game was first showcased were soundly put to rest when Unirally eventually arrived at retail; as the team at DMA had hoped, it was rightly recognized as an exhilarating combination of speed and stunt work, pre-dating the delicious trick-based mechanics of Tony Hawks Pro Skater by some margin. Reviews were almost unanimously ecstatic and the long-term success of the title seemed assured. However, ominous rumblings were emanating from the offices of Pixar Animation Studios, producers of Disney-marketed hits such as Toy Story and The Incredibles. Although back then the company had yet to achieve the worldwide fame they now enjoy, they were still brave enough to take Nintendo on over what they perceived to be wholesale theft of one of their ideas. The problem centred on the Pixar animated short Red’s Dream – produced in 1987 – which featured a cute little unicycle not entirely dissimilar to the ones seen in Unirally. Pixar accused DMA of copying the idea and promptly sued. 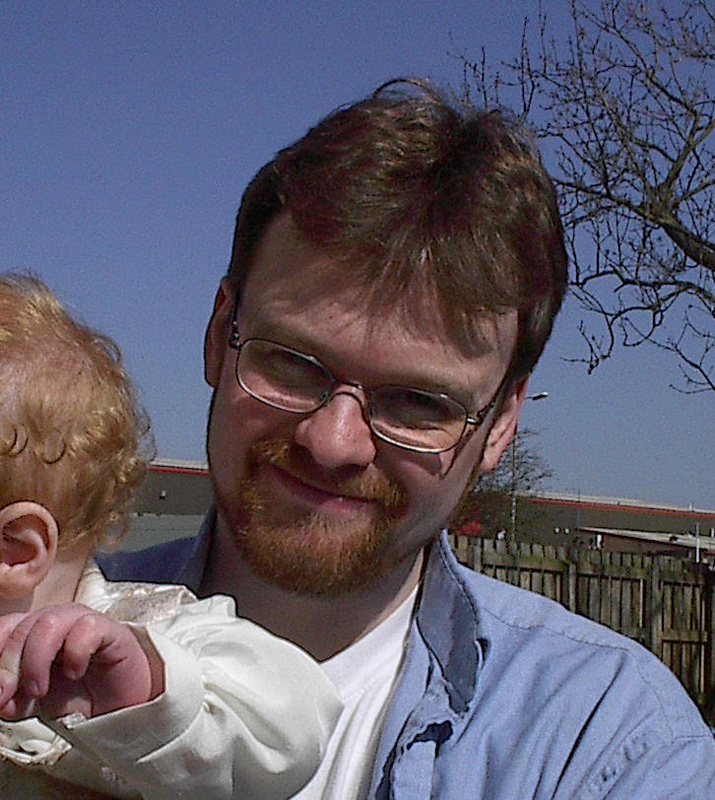 Dailly is still clearly bemused by the whole affair even today. “It’s like someone making a game about a pen, and Biro claiming ownership over anything to do with pens. At the end of the day, we modelled a real unicycle and it came out the way it did.” At the time of writing Unirally has sadly not been earmarked for release on the Wii’s Virtual Console download service and seems as if the passage of time has done little to soften Pixar’s resolve to see the game buried forever. This is a crying shame because it’s high time that this neglected game - an unfortunate and undeserving victim of corporate pettiness - was given a new lease of life. This feature originally appeared in its entirety in Imagine Publishing’s GamesTM magazine and is reproduced here with kind permission. This game looks cool, I will have to look for it at the local used game shop. Should I be sad for the game or should I facepalm for the idiocy of Pixar? This game doesnt just look cool it WAS cool, in fact it was very cool. The gameplay was amazing the graphics were great and I am sad to have ever sold it. Wait... Pixar once did [a] stupid thing[s]? I knew Uniracers/Unirally [NA/EU] (SNES, 1994) [which I wish to play someday] was based on Pixar's 1987 short film Red's Dream [which I've watched online]. I looked it up a year or two ago. I never knew it was accused for "plagiarism". Despite all this, I can't wait to play the game someday. I'd love to buy this game on Virtual Console if they could emulate it properly... too bad it doesn't sound like Pixar will let that release happen though. Frankly, it's a rather assinine decision on Pixar's part if the story is accurate. How would this (excellent) video game hurt their sales or their image? Count me out for future Pixar films. I still have the cart of this on my SNES, bought it on day one because my Nintendo Magazine said it was simply awesome. I'm never letting this sucker go! I loved this game on the SNES. Was damn difficult as well! Was curious why no VC appearence... at least I know why now. Nice feature, I always wondered why Uniracers was MIA on the VC. Glad I still have the cart. I've lost, tossed, traded, and sold most games I owned from that era, and my SNES has disappeared, but if I get another i've got the one game I need. When this game came out on SNES there was a lot of hype surrounding it, so I bought it. I don't think its that good, Probably just about worth 800 points at a push if it came out on VC but I won't be getting it if it does. EDIT: Not very, based on current eBay going prices. Oh, well, I guess I'll just keep it, then. I claim copyright on cupboards, because I made a 3D one once in Blender. I'm sueing Ikea for billions. I've been interested in Uniracers for years. I should purchase it one of these days. I think it's very wrong that they lost the court case over this game. That animation has absolutely nothing to do with the game other than the fact that there is a unicycle in it that animates slightly. Imagine how many lawsuits there would be if everyone tried to pull that kind of crap. I have it on my SNES, very creative and underrated racing game. We had a ball with this game back in the day. Release it on VC please! I remember purchasing this game based off of the ads in Game Informer (May 1995) and from seeing a demo in Toys R Us. I remember this game being one of the final full-packaged games that I purchased before I finally moved on from the 16-bit era of gaming. There were three kinds of levels in the game: race (to the finish), circuits (laps) and the stunts courses where you attempt to get perform the most tricks before time ran out. There wasn't much variety in the music but the unicycles themselves were not only well animated but had personally. Sometimes the losing unicycle would pound it's "head" repeatedly at the end of a race or hang it's seat in shame. The way that the game taught you how to read the track (meaning if it turns solid yellow, then jump) added a lot to the game, too. As you can probably tell, I really liked this game. I might even have this in my old SNES box downstairs in the bookcase (the battery must be shot though). Oh my god, I have never heard this story before, thank you for bringing it to our attention. I also didn't realise DMA made Unirally/racers until now. It's pretty sickening to read, and if true has lost me massive respect for Pixar. Nintendo should get revenge for them and crush pixar claiming that WALL-E is a rip-off of R.O.B the robot. How utterly ridiculous. I never knew this story. I always wondered why this game wasn't hugely popular. Everyone I knew who played it was completely floored. I didn't like Pixar before, but this has sealed the deal. This game a so much fun, I had totally forgotten about this game till now. What isn't this on VC? @JimLad: Walli really does look like R.O.B. But R.O.B. 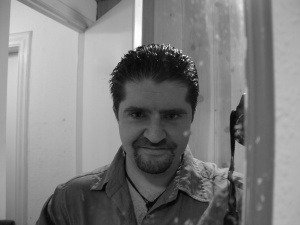 had been around since the eighties, and Walli hasn't. I remember another lawsuit similar to this also during the 90s, when Furbies were all the rave: the producers of Gremlins sued the toymaker because the Furbies bared likeness to the Gremlins (they looked really cute prior to being exposed to water, which turned them into monsters). 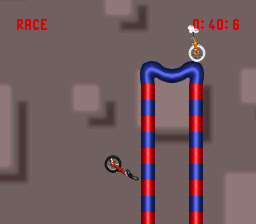 But I think Uniracers would never have been an issue if it weren't for the Unicycle being Riderless. Meaning if they'd put dudes on the Uniracers, then Pixar wouldn't have sued. I ordered the game on Amazon Marketplace. I hope it's worthwhile. "Announced in the CGI-tinged wake of Donkey Kong Country, "
I hate to nitpick (OK that's a lie) but Uniracers was released before Donkey Kong Country. I bought Uniracers back then, t'was a simpler time when I would just mosey over to Toys R Us and browse around the games until I found one that looked interesting. But unfortunately I can't say I recognized it as an awesome game. My recollection is that I played it for a few hours over the course of a few days, never touched it after that, and ended up selling it. In fact, you need to go no further than the court records, which are public, to see that virtually none of this is true. No "moron judge" ever decided (or had an opportunity to decide) anything; the copying was apparently so demonstrable and obvious that Nintendo (which is not known for backing down from a fight) capitulated almost immediately after the case was brought, before any judge had an opportunity to look at the evidence, much less make a decision, even a preliminary one. Pixar's claim was not that they owned the concept of animated unicycles, or even that the unicycles looked the same. The claim was that the animation of the Uniracers cycles (particularly for turns, acceleration, and deceleration) was slavishly copied, frame by frame, from the animation of Red, the unicycle in "Red's Dream." 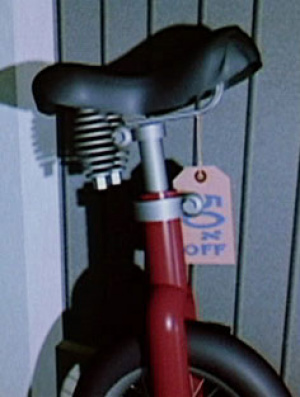 There are, in fact, a multitude of ways that a unicycle could be animated, but DMA chose (as Pixar had) to anthropomorphise their cycles by making the seat analogous to the "head," and, for example, having the seat pivot in anticipation of the cycle's turns, so that it would appear that the cycle was "looking where it was about to be going," and to have the seat/head "crane its neck" forward as the cycle leaned in the direction of travel, in order to give the appearance of "intelligence" to the cycles. The problem wasn't so much that the unicycles were "computer generated," or "looked alike," but rather that DMA appeared to have replicated Pixar's specific animation choices in order to convey the personality of the cycles, rather than coming up with their own expression. It also doesn't help things that the author of this article didn't look to the source material, saying "Pixar accused DMA of copying the idea and promptly sued." Pixar didn't accuse DMA of copying an idea. Pixar accused DMA of having copied the specific expression embodied in Pixar's animation of Red... and apparently Nintendo (which at the time dwarfed Pixar in size and resources, and could easily have defended itself and DMA if there were any doubts about Pixar's claims) felt it was sufficiently obvious that Pixar was right that Nintendo opted to immediately take the product off the market rather than go before a judge. It's easy and fun to blame "moron judges" for outcomes you don't like; everyone knows that judges make mistakes, and it's compelling to claim to have been the victim of such a mistake. Here, though, the fact that Nintendo backed down to tiny little Pixar rather than risk putting the evidence in front of a judge, speaks pretty loudly. Either way, it would be great to see this game again. I owned it back in the day and absolutely loved it. I'm guessing royalties would have to be paid to Pixar now, though, and that seems very unlikely - let alone the fact that DMA is now rockstar - so its likely lost in time. So Pixar thought that any computer generated unicycle belong to them as if they had invented the unicycle or the computers themselves? Both Pixar and the judge were idiots.